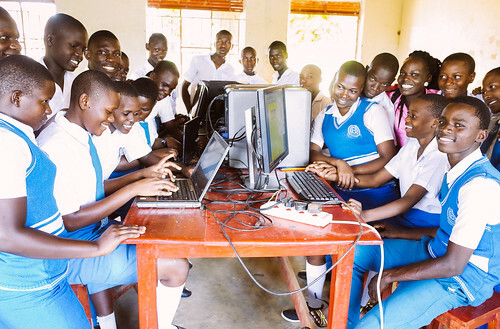 Photo: Students at our rural boarding high school are ecstatic about the new computers recently added to the computer lab. April 2, 2019. We are happy to report that in February we harvested 1 ton of corn from our farmland which is providing a delicious staple in our children’s meals. This abundant harvest also gave us a net profit of $3,000 in savings realized from not having to purchase corn at the local market, thus enabling us to buy other foods for the children. We are also thankful that our banana trees recovered from the previous drought and are currently producing fruit. We harvest enough bananas biweekly to give us a net profit of $250 in savings since we do not have to buy bananas at market. The bananas offer a nutritious addition to the children’s diets, providing potassium, vitamin B6, vitamin C, and other vital nutrients to keep the children healthy and full of energy. However, another drought began in February which could affect our ability to prepare for the next corn harvest and keep our banana grove healthy. Our inability to farm during seasons of drought highlights our ongoing, urgent need to raise $5,000 to purchase a piped irrigation system large enough for our farmland which will be a powerful, efficient irrigation method. Once this system is installed, we will be able to utilize corn and bananas and other organic crops — such as beans, tomatoes, green peppers, collard greens, eggplants, watermelons, oranges, and mangoes — more consistently, feeding the children in our programs and selling the surplus to boost our programs’ activities. In other good news, our high school students were thrilled to receive 10 refurbished laptops in February as part of our goal to acquire 50 laptops in total to create an up-to-date computer lab on campus. Thus, we are now seeking to raise $8,000 to purchase 40 more laptops ($200 each). This is one of our greatest needs at the moment so that our high school students can further excel in their daily studies, more students will be able to use the increased number of computers at the same time, and they will be able to improve upon the computer skills portion of their end-of-semester exams as they will be using more efficient laptops. We are very proud of the 62 high school students who took their national exams in October, all passing with excellent scores. We currently have 200 students (ages 13-19) enrolled at our high school on our main campus where they have been studying English, math, chemistry, physics, biology, history, geography, commerce, agriculture, computer skills, entrepreneurship, and Biblical electives since the school year resumed in February. When these children are not studying, they enjoy playing soccer, jumping rope, playing hide and seek, and sharing stories with each other. We recently assessed how many of our high school students pursue a higher level of education at local universities after graduation versus those who are not able to do so due to the expensive costs of college tuition. We discovered that after high school, the majority of our students are not able to afford a college education even if their high school grades qualified them to attend higher institutions of learning. Thus, the new head teacher at our high school came up with the idea to start a skills education program for such students. With your support, we hope to launch this program soon, teaching these students day-to-day life skills such as catering, hairdressing, tailoring, carpentry, brick-making, and driving as these are skills in demand in their local communities, and these jobs would be readily available once the students graduate from high school. We are also very proud of the 14 primary school students who took their "Primary Leaving" National Exams in November, all passing with good scores. 9 of these students were promoted in their education thanks to scholarships from our high school. The other 5 students decided to pursue our forthcoming skills education program and work in the local community. We currently have 250 students (ages 4-13) enrolled at our rural primary school where they have been studying English, math, and 2 levels of literacy since the Ugandan school year resumed in February. When these children are not studying, they enjoy playing fun games and activities with each other similar to those of the high school students. However, we desperately need to make some improvements to the rural primary school to create a safer and more comfortable learning environment for our children. The old makeshift building fell down after a severe windy rainstorm right before the current school semester began. This makeshift structure was accommodating three classes and now we have to improvise by making the students study on the veranda of the permanent building while others study under the trees. When it rains, these students have to stop and join the other students in the permanent building. Therefore, we are seeking to raise $20,000 to build a larger, furnished additional permanent school building as soon as possible. In addition, we need to construct 2 new pit latrine toilets (one for the girls and one for the boys) as our old one is full and at risk for becoming a health hazard for our primary school students. We need to raise $6,060 to buy the construction materials and pay the labor fees in order to build both new pit latrine toilets. We currently do not have electricity at our primary school, so with your support, we are hoping to raise $5,000 to purchase a solar power system, which is much more cost efficient than the typical electricity system using cables and poles that are sourced very far away from our rural location. Once we can produce electricity using solar power, our primary school students will be able to study after it is dark, and we can install security lighting outside.